I'm a big SF fan (more so than Fantasy), so the new book sounds terrific to me. I think it's so cool the way Andrew and Adam work together. Yes, BIC is the hardest part. and I wish I had a collaborator to help me with discipline, too. An animated movie! Very cool. And I can vouch that releasing another book in a series bumps up sales of the first one. Super cool. This is one my kids would adore, and with a movie coming? That's just too cool! I bet this is great. My family loves The Familiars books, and I'm sure we'll like this too! What a charming book! It sounds like they work perfectly together. This sounds like one for my son! What a great cover too! Thanks for the chance to win a copy. Great interview. I really enjoyed The Familiars, their blog tour for its release was hilarious. It's also a great book and happy to hear the next is coming soon. I like the sound of this book. 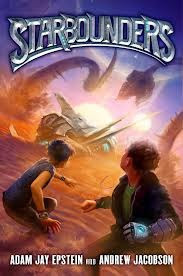 I am eager to read a MG Sci-fi. Great interview! I'm always so fascinated by writers that choose to write together. Writing is such a solitary lifestyle, and I think it would be fun to have a friend with you the whole way. Sounds like a great series! Wow! Writing line by line together sounds really cool. I can see where you could push each other through the tough spots, and spur each other on with excitement and encouragement. Both series sound like fun reads . . . and you get to work with Sam Raimi. Wow! I am seeing more and more collaborations. This sounds like a fun series. Thanks for the chance to win. We're huge Star Wars fans, so I'm sure my son and I would love this book. Sounds awesome! I like their theory that you write the story you want to tell and let all the professionals decide where it fits! Oh man I wanted to go to Space Camp so badly when I was a kid. And I wasn't far from Cape Canaveral either. But it was just too expensive. My brother and I have written several screenplays together, and that's the way we do it - sitting beside each other going line by line. But I can't imagine doing that with someone who wasn't family because we can easily disagree or even yell at each other knowing that we'll still love each other in the end.